This is why we don’t have any Churchills or Teddy Roosevelts anymore. Harry Potter and the Deathly Hallows, Part 2 was the best-selling movie in the United States in 2011. But what other fantasy world made almost twice as much money, in just its first month of release, as Harry Potter did during the whole year? The answer is Skyrim. It took in an astounding $650 million in November alone. How come you have never heard of it? Skyrim is a video game. It is about a dragon god who is prophesied to destroy the world. It is the player’s job to become a thief, a warrior or a wizard and battle him. It is an open-ended game with quests and journeys that allow players to “explore richly textured worlds filled with choice” for hours a day, or whole days and weekends at a time, or if they choose—continually (Christian Science Monitor, March 18). Video games have become a forceful—even dominant—part of American culture. They are America’s new national pastime. Yet most people are totally unaware of how prevalent and influential video games are in society. 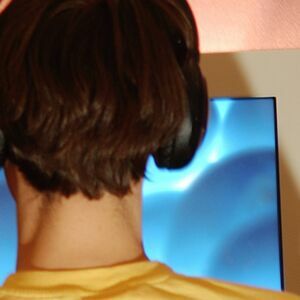 As the Christian Science Monitor brings out, 183 million Americans play video games at least an “hour a day.” Virtually all Americans (97 percent) ages 12 to 17 play video games. And almost 5 million Americans play at least 40 hours a week—the equivalent of a full-time job. It is an industry that rakes in tens of billions of dollars per year. And it is an industry that thrives on hooking and addicting users. Millions of people live, breath and play in virtual worlds. It is not only young people either. Atari hit it big in the early 1970s. Today, one quarter of all gamers are over the age of 50. But why are so many people, of all ages, enthralled with video games? Speaking as the feature presenter at a conference in Las Vegas, which has named Skyrim the “game of the year,” industry legend and Skyrim director Todd Howard offers another explanation. “What can games give you that nothing else can?” he asks. The answer: Pride. “Pride in something you did,” he says. Are we really so desperate? Are we so lacking in aspirations and accomplishment that this is what it has come to for so many Americans? What a horrible and sad statement. By the time the average American youth turns 21, he will on average have spent 10,000 hours playing video games over the course of more than a decade. Imagine what those 5 million Americans who spend 40 hours a week playing video games could accomplish if they instead devoted that much work to something useful. In just five years, this country would have 5 million more master designers, craftsmen, engineers, pilots, scientists, builders, artists, architects, painters, geologists, farmers, inventors, poets, screenplay writers, opera singers, tuba players—the list goes on and on. Imagine how different America could be if the 183 million Americans who spend at least one hour a day playing video games did the same thing. And now imagine the world we might live in if all these people took just a portion of that time and spent it with their families and taught their children how to become experts themselves. What a different, more prosperous, more inspiring, more beautiful world we would live in. How would your life be different? Are you willing to change the course of your child’s life? Many people look at America and decry its deficiencies. People see its economy collapsing. They see America’s waning influence and its growing list of enemies. They see the political fighting and dysfunction in Washington and a house divided among itself. They see a nation of eroding morals and common decency. And they wonder, why are these things happening, and why doesn’t someone stand up and put this nation back on course? The book of Isaiah aptly describes society today. “For, behold, the Lord, the Lord of hosts, doth take away from Jerusalem and from Judah … the mighty man, and the man of war, the judge, and the prophet, and the prudent, and the ancient, The captain of fifty, and the honourable man, and the counsellor, and the cunning artificer, and the eloquent orator. And I will give children to be their princes, and babes shall rule over them” (Isaiah 3:1-3). More than at any time in America’s history, this nation needs strong leadership. It needs masters in all the fields of arts and sciences to rejuvenate its broken economy. It needs skilled orators who inspire people in the right ways. It needs wise experts to offer counsel. It needs Galileos and Thomas Edisons. It needs Rembrandts and Edwin Hubbles. And it needs Churchills and Roosevelts. It needs a people who can accumulate real-life accomplishments—not take pride in fantasy world achievements. Instead, it has a new national pastime of dubious value, and millions of under-skilled adults, increasingly reliant on government welfare, acting like children.